Some days we make the extra effort of trying a new hairstyle and we bring out our curling iron. If you have ever used a curling iron you know you need to commit. You cannot do a half job and walk with the half of your hair all curled up and the other half just natural. Curling irons are great for those days that you want to have a change in your look. Getting a different look does require us being careful otherwise we will end up with the famous iron burn. I’ve had multiple ones by now but the one I was embarrassed the most about was one on my forehead. It was a straight dark red line that crossed diagonally on my forehead. To prevent you from feeling this way and from ever going out like I had to, we will talk about some tips on how to prevent them but also how to treat them. There is not much we can do to prevent burns from happening except being careful. It is important to take our time when we are curling our hair, otherwise, we are more prone to suffer from these kinds of accidents. If you are in some kind of hurry maybe skip curling your hair that day, and only do it when you know you can take your time. Having a mirror can be just as important as it can be confusing. 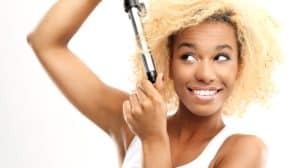 Having a mirror is great to see what areas of your hair are finished and what section still needs to be curled but, since when we look in the mirror everything is the opposite, it can be quite difficult to assess where your skin is and where the curling iron is. Just move slow so that you can micro adjust instead of having moved too much. You burned yourself… this happens sometimes, even if you tried not to. The first thing you need to do is to rinse it for about 10 min minutes with cold water (preferably not too cold). Do not put ice on it since it’s going to shock your skin by the change in temperature. Some people advise putting an ice pack on it but I would not recommend this at all. Do not do anything else besides rinsing with water during those 10 mins. Burns can be tricky since we don’t know how deep the burn is sometimes tissue keeps burning in the layers below because it was not rinsed properly. So to prevent any burns from advancing it is very important that you follow through with this. Important: You will need to assess what kind of degree burn you have. Only continue with the next steps if your burn is a first-degree burn. If it’s a second or third degree burn YOU NEED TO GO TO A DOCTOR. Do not try to fix second and third-degree burns by yourself since you might even need to take antibiotics or will need an antibiotic cream. I repeat, ONLY TRY THESE TIPS IF IT’S A FIRST DEGREE BURN. But how do I know if I have a first, second or third degree burn? First degree burns: These burns are very mild. First degree burns happen when you only burn the top layer of your skin. There can be a bit of redness and tenderness around the area but you won’t have blisters or any long-term damage. Third degree burns: This is mostly an open wound. Both skin layers will be open. There will be probably some damage to the nerves. Please seek medical advice if at any moment you think you might have a third-degree burn. So now that we’ve established the types of burns please only continue with there tips if you have a first-degree burn. Do not use any of these tips if you have an open wound. This is a compilation of DIY things you can do at home to help your burn heal faster and prevent any scarring. One of the most important things to treat a curling iron burn is to moisturize the affected area. This can be done with several things but we’ll be mentioning a couple that you might have at home. Vitamin D: Same principle as the vitamin E. Open a capsule and rub it on the affected area. Apply 3-4 times a day. Aloe: Aloe is great for sunburns and it works the same way with first degree burns. It’s great to relieve the pain and it keeps your skin moisturized for a long time. You can buy the extracted gel at your local beauty shop, here on Amazon, or take a piece of aloe and cut the skin off and then apply it. You can do this 2-3 times a day. Coconut oil: Coconut oil is great to apply on a first-degree burn since it has antibacterial and antimicrobial properties preventing any infection from happening and keeping the skin nice and moisturized in the meanwhile. Apply on the affected area 4-5 times a day. Cucumber: Placing a slice of cucumber on the affected area can help reduce the sensitivity and since cucumber helps to revitalize the skin it will help prevent any scar for forming. This is best to do after applying some oil or aloe on the hurt area. Do this 1-2 times after having burned yourself. It’s best to leave the cucumber on the affected area for about 20 min. Honey (helps moisturize and prevents scarring). Apply a couple of drops on the affected area and spread it evenly with your fingers. Apple cider vinegar (prevents blistering). Apply on a cotton pad and dab it onto the burned area. Essential oils (like lavender or tea tree oil which are antibacterial). Apply a couple of drops on the affected area and spread with your fingers. Ibuprofen and/or Advil: This medication helps to reduce inflammation on the burn and will help bring it down. It will also work as a painkiller and take away any discomfort you have. Hydrocortisone: Buy a 0,5 or 1% Hydrocortisone cream. This cream will help reduce inflammation and ease the pain. You can also ask your doctor for tablets if the pain is too intense. Since burns do not heal overnight we will need to be cautious the next days if we want the burn to heal as fast as possible. Here are some things you should incorporate in your routine to speed up the process. Do not touch: Try to avoid touching the burned area. Also, avoid anything that will cause friction in that area. Do not pick the skin: Once the skin starts healing there is a possibility that the skin will start to flake. Do not pick those flakes. This may cause scarring. If you are looking for something that will speed up recovery even more than we will talk a bit about products you can buy online. These products are multi-purpose so that you can use them for different problems. These products are great to have at home for these kinds of occasions. You probably have heard about some of these but if you haven’t, you should give them a try. Calendula cream is great for first degree burns, sunburns, chafing, cuts and more. This cream reduces skin irritation by using natural agents. It’s a great moisturizer and also helps regenerate the burned skin cells into new and healthy skin. This cream does not contain any artificial colour and perfume which could contribute to skin irritation. You can find many calendula creams like this one. These types of creams are easily absorbed by the skin and thanks to the lidocaine it will go to the deeper layers of the skin and fasten the healing process. Herbal creams come with many ingredients but a good combination of aloe and some vitamins work best. Like this Aloe cream that contains vitamin E on Amazon. This will depend on burn itself, how big it is and it will depend on how good you take care of it. Most first degrees burn will heal anywhere between 3-7 days but you might experience some flaking even a week afterwards. Since having a burn on your forehead for a week does not sound like something you’d want to walk around, here are some tips on what you can use to reduce the cover it up without making it worse. Only try these tips if you need to go out and don’t want to walk around with the burn. It is better if you do not apply any extra products on it since it will heal better if you don’t try to cover it. But since we live in a world where it might be very difficult to no go outside for the time of the healing, we will discuss certain things you can do up to reduce the appearance of the burn. It will be hard to completely get rid of the burn with makeup but it will reduce the appearance by 80%. This technique can be used for any area of the body as well. Although if the burn is not on the face I would advise not applying any makeup on it and just let it breathe and heal. Apply some antibacterial cream, Neosporin, or coconut oil to keep moisture in the burn and prevent it from catching any infection due to the makeup. Apply a beauty primer to create a protective barrier between your skin and the makeup. Use a little bit of concealer and put it on the top of your finger. Softly dab your finger on the burn a couple of times until the colour or the burn is the colour of the foundation. Then with a soft brush continue to dab the concealer on the burn. Use a setting powder to go over it to end up blending it all together. You can always use a bit of extra concealer at the end (with a soft brush) to cover it a bit more if you are not satisfied with the results. Burning ourselves with a curling iron is something we don’t plan on. 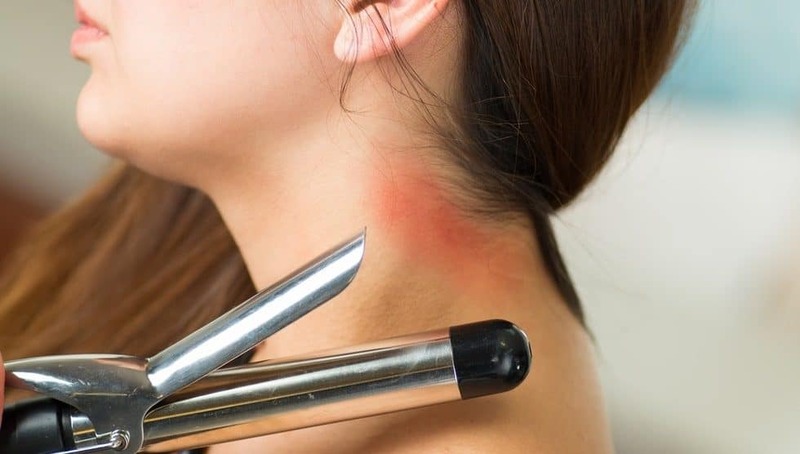 Hopefully, the tips in this article have helped to assess the degree of your burn and offered you insight on how to treat it. Remember that it is best if you treat the burn as soon as it has happened. The longer you wait to treat it, the bigger and deeper the burn will be. If the skin is open or if it’s an open wound don’t hesitate to seek medical advice since open burn wounds are prone to infections.